Are you familiar with Kate Spade New York’s #MissAdventure video short series? The silly and adorable series (shown on YouTube and on Kate Spade New York) features some of my generations most-loved actresses – Anna Kendrick and Zosia Mamet, to name a couple. As I’m sure you know from their fun and fabulous pieces, adventure and spontaneity are both at the core of the Kate Spade New York brand. In addition to highlighting pieces from each collection, each #MissAdventure episode celebrates adventurous, one-of-a-kind (but totally relatable) women. Season 2 of #MissAdventure launched on Monday with The Perfect Weekend, a tale about a girl’s weekend that goes comically, perfectly wrong. 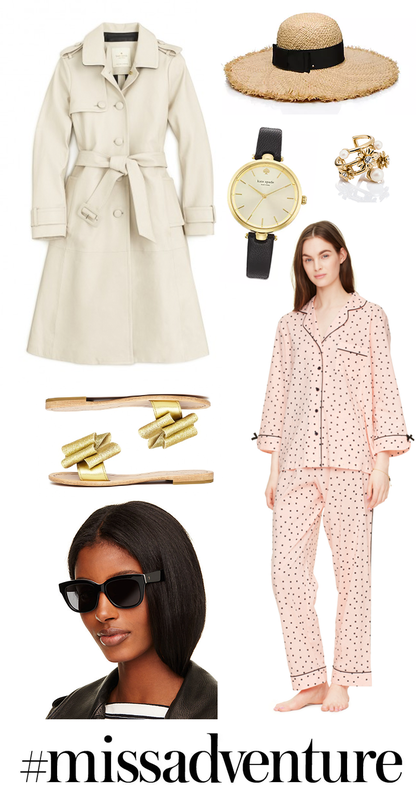 As part of the launch, I’m sharing pieces from Marisa Tomei’s character in the video – who wants to buy me that trench? Classic. I can actually totally relate to her outfit when she runs over to ask the girls to move their car – I spend so much time at home in my workout clothes or pajamas, and have to throw on a robe (and sometimes a coat) to answer the door or run out to grab the mail. Press play below to watch the premiere of #MissAdventure season 2, and click here to shop from all of the character’s closets! Also, be sure to check out Kate Spade New York’s YouTube channel to watch all of the previous #MissAdventure videos! This one might be my favorite. I LOVE the Anna Kendrick one, and will definitely watch this. Been eying that black leather band watch for a while; KS accessories are so good. I always love watching the previews for these videos on Kate Spade’s Instagram! Love those pajamas! What a cute series! I’m a big fan of these ladies so I’m hooked! Really nice finds I love the hat and coat, so gorgeous. I love all these pieces especially that trench! I just stumbled upon your blog from a comment you left on Allyson In Wonderland and I’m obsessed. I’m currently drooling over all your collages, especially #missadventure! I would love for you to stop by my blog sometime! Are styles are very similar and I love growing my blogging community!! I will be def. adding The Style Scribe to my daily reads! Great picks! That hat is especially good! I’ve never seen anything like it!